In weather readings find cities where temperature is higher than 25°C and the sky is clear. The example is based on data from openweathermap.org API. See the JSON file. $ points to the root of the document. It can be either object or a list of objects. 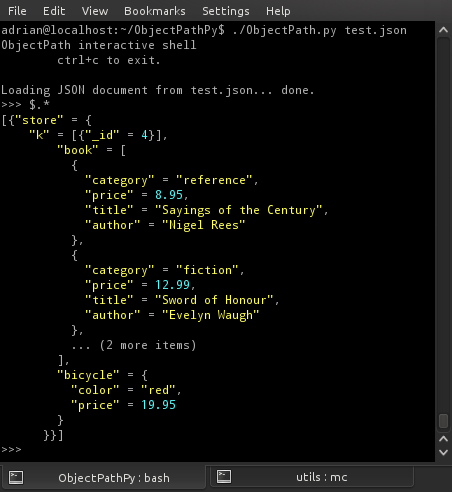 ObjectPath queries works for both! Here the JSON document describes weather readings within provided geopraphic coordinates. @ points to current item from the list generated from executing expression on the left side of . Here we check if temperature in each city is greater than 25°C. .. finds all objects in the subtree. Here it selects all objects from the readings. * selects all objects from array. This is a helper for .. operator. ObjectPath supports a vast range of simple operators including boolean, arithmetic, comparison... and so on. The full list of operators is available in the ObjectPath reference. These are properties of objects that will be checked against the expression. Loading JSON document from //URL-to-API/call done. Easy to start with and suitable for complex data-discovery jobs. Allows for working with big nested tree structures. Up to the size of your RAM. Available in JS and Python.